I had a hankering for some eggs benedict this morning. I had all the ingredients so I started cracking with a poached egg (pun intended). 😉 Now, I’ve poached eggs before but never that often and usually not that successfully. And then I found this simple recipe which suggested using a mason jar ring top to sort of guide the egg so it doesn’t spread in the water and get all yucky. It worked! It came out beautifully. Then for the hollandaise. This has been something that I’ve wanted to do but for some reason had one of the brain road blocks that made me think it would be hard. It probably is hard if you try to do it by hand but I found this great recipe that just requires adding ingredients to a blender. Voila! BTW the directions below seem lengthy. Its actually SUPER easy so just read through everything once and you’ll get it. Brunch at home just got better! Fresh eggs will be easier to poach (they’ll hold together better) than older eggs. Vinegar is optional, it will help the eggs hold together, but if you don’t like the taste, omit. 1 First bring water in a saucepan to almost boiling. If the water is already boiling, lower the heat until it is no longer boiling. At this point, you can add one or two teaspoons of vinegar to the water, if you want. The vinegar will help the egg whites to congeal more easily. We use seasoned rice vinegar. 2 Working with the eggs one by one, crack an egg into a small cup, then place the cup near the surface of the hot water and gently drop the egg into the water. With a spoon, nudge the eggwhites closer to their yolks. This will help the egg whites hold together. 3 Turn off the heat. Cover. Let sit for 4 minutes, until the egg whites are cooked. 4 Lift eggs out of pan with a slotted spoon. One trick to make the eggs stay somewhat contained is to take a ring from a mason jar and place it in the pan. Drop the egg over the mason jar ring and let it settle in the ring, then turn off the heat and cover. Put the egg yolk, lemon juice, and cayenne in a blender. Pulse a couple times to combine. Toast english muffins and set aside. Place thick sliced ham on top of each english muffin half. 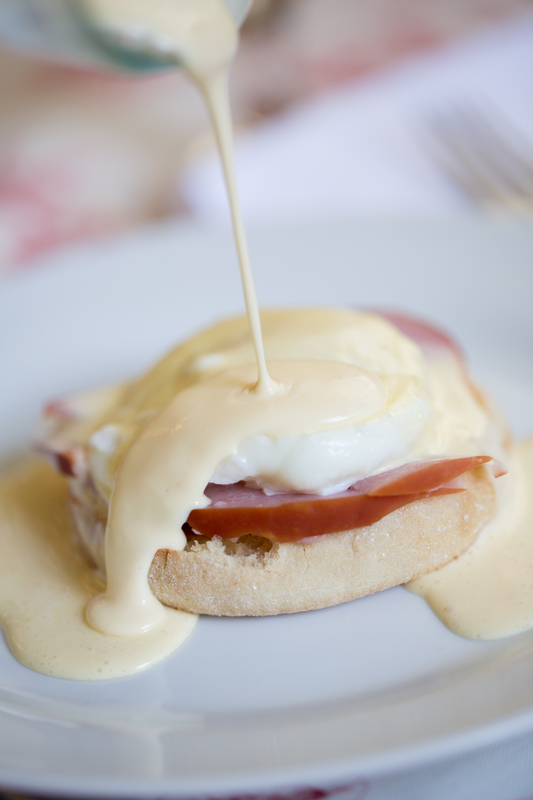 Top the ham with the poached egg and pour the hollandaise on top. Enjoy!